We are on round 4! These last ten days, the Guiding Thoughts return to using me and I for the pronouns. See how your perspective of your self has changed through using you or we the past twenty days. See if your sense of self is bigger; if you can include a broader vision of “you”. You may also choose to continue to take a moment before the Journey to listen to this quickly—it is a thought for others, so that the effects of this Journey ripple out! Oh, my beautiful blissful heart! How can I deepen and expand my relationship with you? How can I give your love, your wisdom, your compassion more openly and freely? How can I know you, my heart of love, as myself? Click here to access the audio file. You can download this and play it in a loop while you allow your heart to speak to you :). I suggest Windows Media Player (I have not tested other players). Even though there are other words that I could have focused on in this guiding thought, my mind was drawn to thinking about allowing Love, through me, allowing my heart—the heart of wisdom and compassion, to become more predominant in my conscious actions. This picture shows a Heart of Wisdom surrounded by brilliant, loving light above the figure’s head. I’ve realized when I draw a heart above, like today and on days 25, 24, 21, or 2 (link to these days), it represents something like a unifying heart, or the One Heart that we all share, the central heart that pumps out love for all. I don’t know exactly what to call it. That’s the thing about pictures, there’s a sense that can be related that is hard to describe in words—think about Mona Lisa’s smile. What exactly is it relaying? So the feeling I get is that there is a heart that connects us all, that we can tune into, for healing, love, and learning. I like to sit and look at the pictures, feeling the meaning, allowing myself to absorb the sense of them. What sense do you get? Do you have any similar senses in your own works? The spiral inside the heart shows activity. The heart above is very active, always moving, working, doing stuff. Always providing, always generating, always connecting. This spiral comes out specifically to this one figure in this picture, but I get a sense (again) that the spiral reaches out to everyone, all the time. 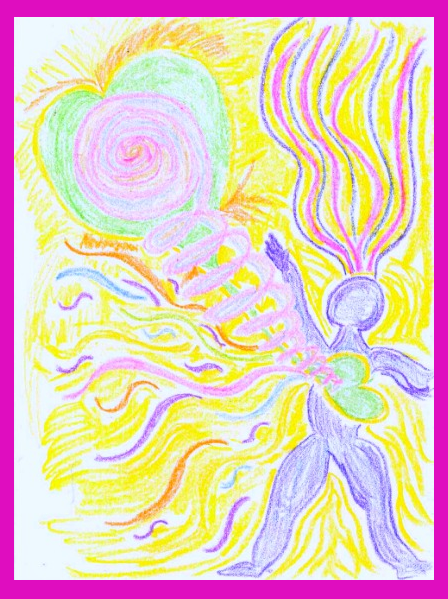 The activity of the spiral reaching out to the figure is the impetus behind the figure generating energy which resonates with the heart’s own wisdom and compassion. The individual heart receives the energy of the Unifying Heart, and is then able to convert it uniquely through his/her heart and then share it—all the ribbons coming from the front of the figure. Somehow, this answers the question: How can I know you, my heart of Love, as myself?